Today in Bethlehem, sunny and warmer than usual by 10 degrees (global warming? ), is Easter Sunday. It is a Sunday where Christians following the Western calendar celebrate the resurrection of Jesus. This got me thinking about resurrection, salvation and what the real message of Jesus, the prince of peace was during his short years walking in the hills that now surround me. “What would Jesus do” is a question that hovers in the background of this troubled land. Well, actually the land does not have feelings to be troubled so let us say the troubled inhabitants of this land. I am certainly troubled as most Palestinian Chritisans and Muslims are. We are troubled because we cannot even get to our Churches and mosques in Jerusalem. Palestinians who are already in Jerusalem are being pushed out as Israel continues its relentless program to make the city “Jewish” (whatever that means). 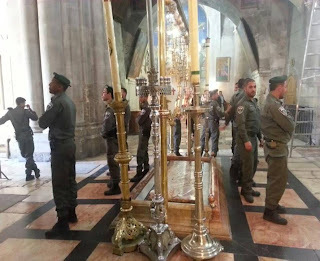 On this Easter, Israeli Jewish soldiers even defiled the Church of Sepulchre where tradition holds that Jesus was crucified and also buried. We are troubled because just yesterday we commemorated Land Day and our commemorations were marred by Israeli violence. Even trying to cling to memory of our lands stolen from us is a crime in the Apartheid state of Israel. A law in the Knesset tried to stop commemorations of the Nakba (the catastrophe of ethnic cleansing of 530 villages and towns between January 1948 and December 1949). But this is just one of hundreds of racist, discriminatory laws that make Israel the quinticential apartheid state. Meanwhile the government of Mr. Abbas approved the “Palestinian Authority” (PA) budget of $3.8 billion that Israeli papers said shows continued dependence on Israel and the US. The PA in the meantime have sentenced morepeople to jail for expressing dissatisfaction with the status quo. In one case even sentencing a person for 6 months in jail for clicking ‘like’ on a facebook post that critiqued the PA. There is indeed a grave danger that we will have (if we do not have already) a police state serving Israeli interests. Decent people in Fatah must take note of what is being done in their name lest we have a “village league” scenario. But back to our main bain and what brought to us the disastrous Oslo and all other disasters: the Israeli occupation. Bethlehem, the Obama visited for 20 minutes, is still besieged and stripped of ist lands. It is still isolated from its sister cities of Jerusalem and Nazareth. We still have a “permit system” worse than the one practiced in Apartheid South Africa. We still have Palestinian children being jailed and tortured. We still have owerful occupation stripping us of natural rsources and impoverishing us. I coud go on and on but then I think again what would Jesus do? He was actually in a similar situation. The Roman occupation was actually milder than the current Israeli occupation (and colonization). realizing they might also play a role in the injustices done to others. I am a Palestinian from the Bethlehem area but who also happens to hold a US passport. The latter does not allow me to enter Jerusalem and the US government will not protect this or other rights I have (including family reunification). Meanwhile, any Jewish American can come and get automatic citizenship and live on stolen Palestinian land in our city. It is hard to describe the level of frustration that I had watching the theater of media frenzy (devoid of any real substance) about Obama’s visit. Obama gave a new lifeline to war and conflict by avoiding human rights and international law. It is the missing ingredient that for the past 65 years precluded peaceful resolution. It is the twisted logic that says the insecurity of the thief must be the only thing to be dealt with by ensuring the victims first recognize the legitimacy of the theft and the legitimacy of the need for the thief to first have full security and immunity from accountability for the theft before the victim is put in the room with the armed thief so that they can work out something (vague and without reference to International law). That formula has been shown to be a disaster and has kept Apartheid and colonization going. Israel has no incentive to allow a Palestinian sovereign state let alone redress the injustice (e.g. refugees, theft of land and resources etc) as long as it continues to get unconditional check from our tax money and guaranteed veto of the US at the UN protecting it from International law. This plus over $12 billion in profits from the occupation of the West Bank and Gaza (captive market, natural resources etc.) ensures the occupation continues. But Israeli and American governments are thinking short term. Long term, the changing reality (in the Arab world) and demographics in Palestine will ensure change. Obama alluded to this when he told Israelis that no wall will be tall enough and no iron dome will be strong enough and that peace is imperative. The problem is he failed to follow his own logic and press Israel to change and instead repeated the same failed logic that "bilateral" negotiations between a strong occupier/colonizer and a weak leadership of colonized/occupied people is the way to go. Below are some of the things that happened during Obama’s short visit. You be the judge of their value or relevance to bringing peace. Palestinian and American security coordinate to clean streets of any thing that might allude to Palestinain rights (refugee signs, maps of historic Palestine etc). They change all manholes in targeted areas spending millions for excessive “security” for the unwanted visitor to Bethlehem and Ramallah. Palestinian security preemptively arrest dozens and suppress peaceful demonstrations succeeding in isolating Obama from seeing Palestinian anger. Massive traffic jams, and on days of visits an essential siege and curfew on Ramallah area (Thursday) near Al-Muqata and Bethlehem (Friday). The preparations create significant damage to economy and livelihood of tens of thousands of Palestinians. Selected choreographed visits by Obama to Hertzl’s and Rabin’s tombs (the former who called for ethnic cleansing, the latter who executed it) but not to Yasser Arafat’s tomb. American flags placed by the Palestinian Authority (PA) along the streets removed by Palestinian activists. 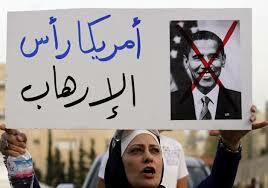 PA security officials suppress demonstrations and prevent activists from getting near Obama. At Ramallah demonstration, PA security dressed in civilian cloths attack demonstrators. Obama calls on Palestinian officials­­ to resume bilateral negotiations that led to nowhere in the past 20 years, to accept Israel as a “Jewish state”, and not to seek implementation of International law via International bodies like the UN or the International Court of Justice. Perhaps not coincidentally, the Palestinian mission in Geneva has put out mild drafts that do not take advantage of the strong findings of the UN Human Rights Council (see item link below). Obama brokers a deal by pressuring Turkey to accept a tepid Israeli statement of regret for the deaths of Turkish citizens with some compensation for families and restoring Turkish-Israeli strategic relations (presumably including military cooperation). Turkish demands for lifting the siege on Gaza is dropped. Obama, like his predecessors, identified Hizballah, Syria, and Iran as a dark axis of evil while Israel as a perfect model of democracy and beauty. Obama in his speeches adopts the Zionist myths that Apartheid Israel is redemptive and that it is the guarantee against another holocaust (it is actually the reverse). Obama fails to mention that this “great and technologically advanced country” is actually built on top of Palestine and by destroying 530 villages and towns and by looting property and patrimony of millions of Palestinians. Obama defines what we Palestinians want (supposedly a vague “viable state”) even though for most of us, we want return to our homes and lands and freedom from racism and apartheid. Obama will give Jordan $200 million to help Syrian Refugees. Obama reminds the Israelis that his administration developed unprecedented support to the apartheid state of Israel especially in the field of security. Obama highlighted the Iron Dome system and praised it but now documented data show that they are less than 30% effective as opposed to the government insistence that they had 90% success). Obama claimed the West Bank is in good shape because of Abbas and Fayyad and compared to Gaza which he claimed is miserable under rejectionist Hamas. What Obama and his large entourage fail to mention during this supposed “historic visit”: human rights, international law, the tenth anniversary of the murder of US Citizen Rachel Corrie, Palestinian rights and security, justice, land confiscation, apartheid laws, illegality of settlements, US opposition to Palestine joining the UN, applicability of the Fourth Geneva Convention, how much taxpayer money is given to Israel, the siege on Gaza, the freedom of movement, the attack on US citizens’ rights by Israel…. On the way back from the University of Bethlehem we noted a small bulldozer that has removed a stone monument with a map of historic Palestine (see above) and the olive tree at the entrance of the city (in Alkarkafa). 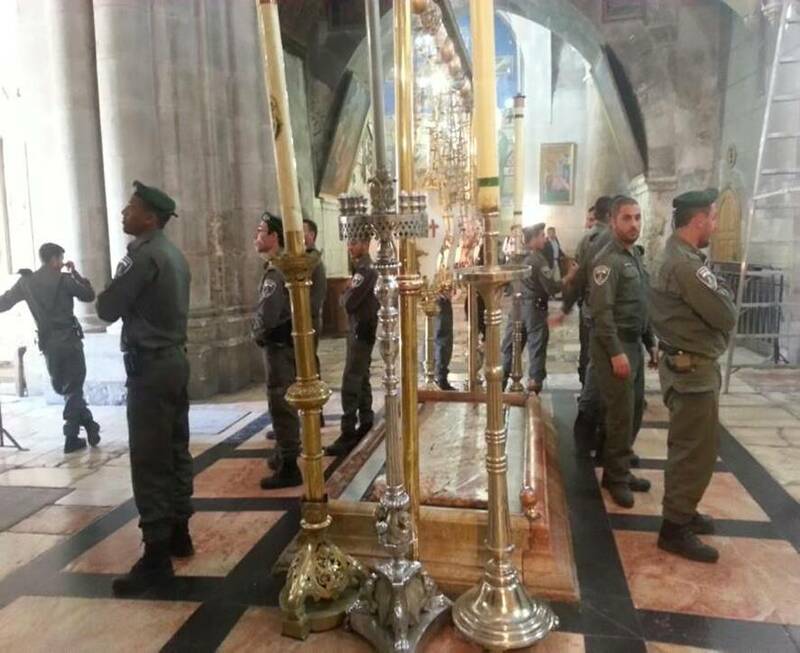 This was not Israeli authorities but the “Palestinian authority” (PA) from higher up but via the Mayor of Bethlehem. Instead of the olive tree and the map, the idea is that Mr. Obama will see a new thing: a dove at the entrance of Bethlehem. The people gathered angry and stopped the work. Some said that the PA was acting as a subcontractor for the Israeli authorities; PA security personnel still patrol the refugee camps like Aida to prevent young people from challenging the Israeli occupation and PA security officials still cooperate with the Israeli security officials. They arrest Palestinians in the West Bank especially those affiliated with Islamic movements and they ensure that people who get government positions are loyal members of one faction (Fatah). Even strictly financial corruption of many PA officials and even after it is widely documented is not brought to justice. As I said while in South Africa, corruption is everywhere in the world and people need to mobilize against it. When Abu Jihad (Palestinian hero and martyr of the resistance) was asked about corruption, he answered in the same way as Nelson Mandela answered: we can root it out AFTER liberation. The experience in South Africa and in Palestine suggest that corruption must be tackled early and forcefully because it is a disease that spreads. To President Obama: We ask you not to be delusional in thinking that those who meet with you represent the common people. When you visit Yad Vashem you should also go down the hill and visit the ruins of Deir Yassin where Palestinians were massacred by the ideological descendants of Herzl whom you will honor. And you will not be welcomed either in Ramallah or Bethlehem. If Palestinian officials had any dignity they would have insisted you meet them in occupied Jerusalem, the capital of Palestine. And the gibberish you will hear does not represent the main demand of the Palestinian people: the right to return to our homes and lands. So even if Abu Mazen says he does not want to go back to Safad, no peace will be possible without Restorative Justice. Action: Save Masafer Yatta: Save over 1000 people including 452 children from being forced from their homes and their land that they have lived on for centuries. Tell Israel to let these villagers live in peace. We salute and mourn lost comrades. We mourn the loss of our young friend Mahmoud Al-Teety shot dead by Israeli apartheid forces who invaded his village. * We mourn President Hugo Chavez of Venezuela who lifted millions out of poverty and showed that governments can serve people needs rather than corporate greed. We mourn Stephen Hessel, survivor of the genocides committed by the Nazis and a human rights defender who supported Boycotts, Divestment, and Sanctions (BDS) on Israel and also helped spread ideas of universal human rights and rejected racist ideas of uniqueness and chosenness. We also commemorate ten years since the murder of our friend Rachel Corrie (US citizen, 23 year old) by Israeli soldiers in Rafah. May we always remember those who worked for human rights and against tyranny and oppression. I just returned from my whirlwind tour of South Africa exhausted but energized. I met with hundreds of people including leadership of the trade union COSATU. The BDS movement is picking up steam in South Africa thanks to the effort of hundreds of local activists (facing a few rich racist Zionists). I need to digest some information before I write more about this experience (and already it will be useful for a chapter I am working on that talks about Palestinian future options/strategies). But in the meantime, actions speak louder than words so here are 6 actions YOU can take (at least select three for this week). 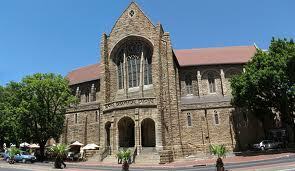 Below is a talk (“sermon”) I gave Sunday 11 March at the Saint George's Cathedral in Cape Town. This is an old and famous Cathedral well known for its struggle against apartheid; Nobel winner Archbishop Desmond Tutu one of its most famous leaders. Thank you Dean Weeder and all of you for inviting me to your historic church, a church I knew about for over 20 years but have never before had the chance to visit. I am grateful to be for the first time in South Africa. It is also named after the patron saint of Palestinian Christians whom we call in Arabic Alkhader. I also thank Terry and Lavinia for your kind hospitality. I came to Johanesburg invited by church leaders to attend the Oikotree conference which links ecology, economics, and ecumenical issues. So I am delighted to also have been invited to Cape Town for the launch of the Israel Apartheid Week and to this lovely church. have been wise to select the Shepherds in this area because had he selected another area, the message would not have spread since we talk a lot and words spread quickly. and he spoke Aramaic which my Canaanitic ancestors spoke (Arabic is a derivative of Aramaic). Since he was crucified, we have lost untold number of people who spoke the truth to power. I lost several friends in non violent resistance. 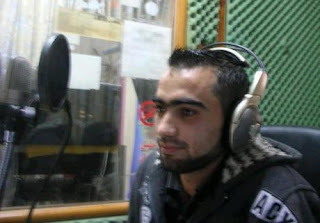 For example in 2009 we lost our friend Bassem Aburahma who was shot with a tear gas canister that crushed his chest as he was talking to the Israeli soldiers. I paid condolences to his family and met his kind young sister Jawaher who was killed a year later when she was overcome by Israeli tear gas. Many others were lost or suffered. I myself was arrested several times for nonviolent resistance. But the family which we visited recently still offers us coffee with a smile. It is joy born of faith while suffering. It is the definition of Love. Mother Teresa said in helping with a smile that "this is where love comes in - when it is demanding, and yet we can give it with joy". As the Buddhists say "Have joyful participation in the sorrows of this world." Glory of the grace of God in this land and in the sufferings of its people. In this spirit the document requests the international community to stand by the Palestinian people who have faced oppression, displacement, suffering and clear apartheid for more than six decades. The suffering continues while the international community silently looks on at the occupying State, Israel. Our word is a cry of hope, with love, prayer and faith in God. We address it first of all to ourselves and then to all the churches and Christians in the world, asking them to stand against injustice and apartheid, urging them to work for a just peace in our region, calling on them to revisit theologies that justify crimes perpetrated against our people and the dispossession of the land. 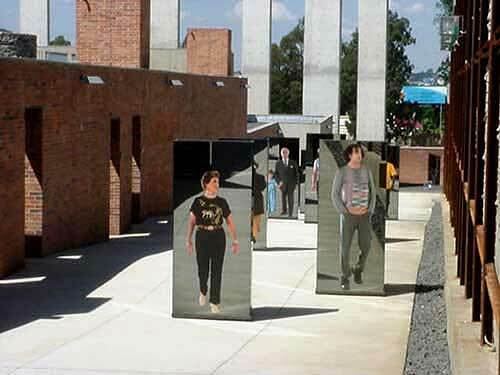 of reconciliation, has become a city of discrimination and exclusion, a source of struggle rather than peace . that 530 villages and towns were destroyed and today 7 million of our people are refugees and displaced people. Refugees are still living in camps under very difficult circumstances waiting for implementation of their internationally recognized right of return, generation after generation. What will be their fate? And the prisoners? The thousands of prisoners languishing in Israeli prisons are part of our reality. The Israelis move heaven and earth to gain the release of one prisoner, and those thousands of Palestinian prisoners, when will they have their freedom? the King shall answer and say unto them, Verily I say unto you, Inasmuch as ye have done it unto one of the least of these my brethren, ye have done it unto me." Note: My wife and I applied for Family reunification over 5 years ago and the Israeli authorities still did not answer to this day. Action: Write to media and your politicians about Israel's racist policies of denying family reunification. RESISTING ISRAEL'S ETHNIC CLEANSING CAMPAIGN IN AREA C: From March 17-29, students, artists and activists from across Palestine and abroad will join the people of the Jordan Valley and South Hebron Hills in their struggle against Israel’s forced expulsion of Palestinian communities in Area C. This ride, organized by The Freedom Theatre’s Freedom Bus together with several grassroots organisations, will occur in solidarity with Palestinian farmer and Bedouin communities who are struggling against attempts to forcibly expel them from their traditional homelands. The March Freedom Ride will include building and reconstruction work, protective presence activity, guided walks, home-stays, interactive workshops, educational talks and cultural events. Through Playback Theatre, residents of the Jordan Valley and South Hebron Hills will share personal accounts about the realities of life and resistance under settler colonialism, military occupation and state-sanctioned apartheid. 22 March 2013 | Jordan Valley | Solidarity Walk and Evening Concert: On World Water Day, March 22, The Freedom Theatre, Thirsting for Justice/EWASH and Jordan Valley Solidarity Campaign will hold a solidarity walk between Palestinian communities whose water rights are denied by discriminatory Israeli policies and practices. The walk will include community visits, discussions and interactive theatre events focusing on the life and resistance of Bedouins, farmers and traditional herders in the Jordan Valley. An evening concert will feature political hip-hop from the world renowned DAM, and reggae-fusion from Ministry of Dub-Key. Dabke troupes from Nabi Saleh and the South Hebron Hills will also perform. The Walk for Water Justice is part of the March Freedom Ride. I did some research with South African scientists on gerbils and had worked briefly in the 1980s against apartheid in South Africa. I have also been talking and reading about South Africa for the past thirty years as a model for Israel/Palestine. I should have also listened to my own advice when I speak about Palestine: come and see because no amount of reading and talking to people outside would substitute for visiting the country itself and immersing one’s body, mind, and soul in a country. So I am rethinking South Africa. I was shocked and dismayed at some of what I saw but I was inspired by the people. Witnessing the miseries of slums like Diepsloot (lit. Deep Ditch) and Soweto (South West Township), I realize that apartheid is not ended here but mainly changed shape and this provides us with lots of lessons for Palestinian struggle against Israeli apartheid. The conference included 50 representatives from some 20 countries to discuss how to bring the world closer to peace and justice and for this meeting to be in South Africa. Its guiding principles include recognizing the connection between ecology, economics and ecumenical (all based on Greek root oikos meaning house). Getting our house in order as human beings is important. In recognizing that an economy based on theological principles entails caring about people and our environment and living a spirituality of resistance and transformation. 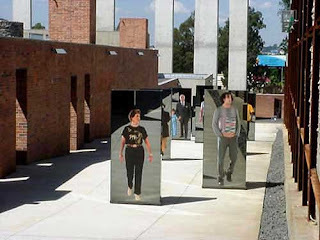 But before the formal meeting began, we were given tours of places like the Apartheid Museum, the Voortrekker monument, the Freedom Park, the Diepsoot Township/settlement, and Mandela’s house. At the Apartheid Museum we were painfully reminded of all the suffering and indignity of the era. The killings, economic injustice, and human rights violations were then rampant as they are today in Palestine (the apartheid state of Israel). But we are also reminded of the struggling human spirit that seeks justice and freedom. The compromises that Mandela made with the white leadership and his attempts to be inclusive and forgiving is prominently displayed. But his earlier statements are also visible as at the entrance “For to be free is not merey to cast off one’s chains, but to live in a way that respects and enhances the freedom of others.” This is line with Mandela’s statement that freedom in South Africa will not be complete unless Palestine is also free. Ofcourse to fit with the world structure, he had to modify his views that Zionism is racism. Turkish Prime Minister Erdogan is now receiving similar pressures because he told the truth that Zionism is a crime against humanity. In January 1985, Mandela was offered release on the condition that he renounces violence. He refused writing to the people in a letter that “Only Free Men can negotiate. Prisoners cannot enter into contract…. I will not sell the birthright of my people to be free.” He insisted that he be released unconditionally and demanded that apartheid be ended before the ANC negotiated. Only free men can negotiate. Pressure built-up on the Apartheid regime via a growing local resistance aided by an international BDS movement. F W DeKlerk explained to fellow Apartheid supporters that the writing is on the wall and that South Africa should avoid the fate of “Rhodesia”. Mandela did not fall into the trap of negotiations while apartheid persisted but he assured the whites of flexibility after apartheid ended and indeed whites kept their privileged class to this day. That was t many ANC supporters a “sell out”. But it was a far less compromise than the PLO leadership agreeing to negotiate while we Palestinians remained imprisoned under the colonial apartheid system. Hence the real meaning of the Oslo process is the 20 years negotiations between prisoners and prison guards (instead of what happened in South Africa where within a span of 3 years negotiations between a freed people and apartheid symbols, the remaining issues were resolved). These and other lessons can be learned from the (ongoing) struggle in South Africa. We learned by talking to people of all backgrounds that he struggle here in South Africa is not complete. Voting apartheid ended in law but economic, cultural, social and truth apartheids still stand. 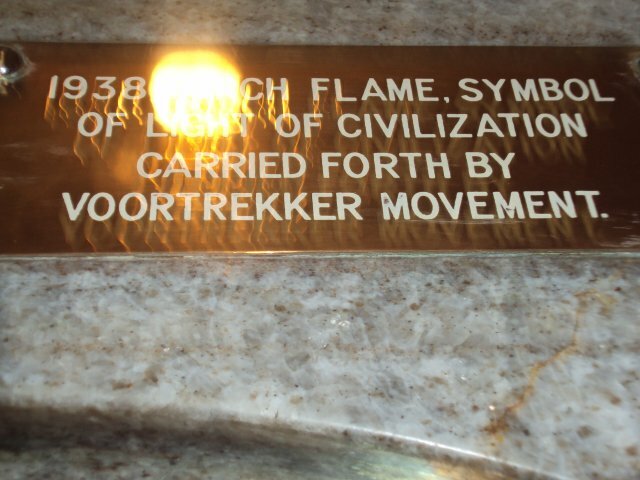 We visited the Voortrecker Monument dedicated to a battle that happened 16 December 1838 where white colonial settlers killed the native people. But that is not what the white tour guide described it. To her, “pioneers” signed treaties with Zulu ciefs, were betrayed by Zulus who “murdered” white pioneers! Whites on their march to the interior of the continent (the voortrekers) circled their wagons when danger came ! Actually the monument has carving of 64 circled wagons around it. To this day white and ony white South Africans gather in the monument every December 16 to honor that pledge made by their ancestors nearly 100 years ago to thank the lord for allowing them to vanguish their enemies in the promised land as they advanced the "light of civilization in the dark continent". Theology of The carved reliefs and the guide show a white democratically elected educated civilized “leader” Retief facing the evil superstitious Zulu king Dingane. That is when a few of us “colored”/black vistors decided we had enough of this tour. The rich still get richer and the poor get poorer; 0.1% of the world population hold 81% of the wealth and the ratio of poverty to wealthy statistic went from 3:1 in 1820 to 35:1 in 1950 to nearly 80:1 today. Sometimes liberation movements fall into the trap of power. 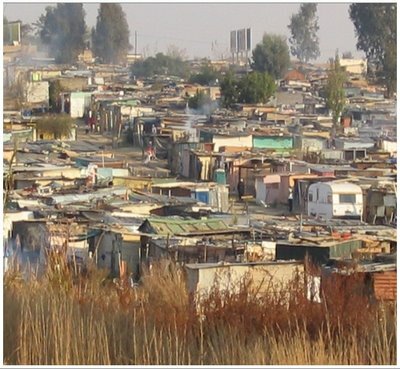 Many of those we met commented on how some members of ANC who came into government jobs at the end of Apartheid got spoiled by the material goods (houses, cars, bank account) that they forgot about the struggling people in the townships and the slums near the glittering skyscrapers. The tallest building in Johannesburg is the Reserve Bank! My tears rolled as we passed by townships that are teaming with poor people because they reminded me of refugee camps in Lebanon, in Jordan, and in Palestine. The most heart-wrenching was Diepsloot where 250,000 human beings live in shacks with sheat metal roofing. Here we visited “Vuselela Ulwazi Lwakho Drop-in Center” (vuselela-ulwazi.org, founded by one woman nurse) where hundreds come weekly for counseling and treatment for AIDS (now a horrific pandemic in Africa). I peaked into a hall and noticed nearly 100 children crammed together – they are the AIDS orphans who lost their parents to the disease (and a few other orhans). 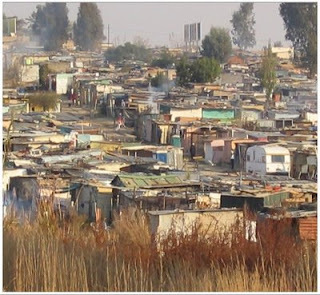 I contrast these images of man-made poverty and disease with the posh gated communities of upwardly mobile mostly white South Africans. It is like contrasting the posh life of the colonial Jewish setters in Palestine with the life in refugee camps. But the hope of the workers and users of this and other facilities show us how the goodness among humans can spread. Ronnie Kasrils, South African minister once said about Palestine: “This is much worse than apartheid..Israeli measures, the brutality, make apartheid look like a picnic. We never had Jets attacking our townships; we never had sieges that lasted months after months. We never had tanks destroying houses.” Archbishop Desmond Tutu, a Nobel Peace Prie winner who headed the Truth and Reconciliation Committee said Israel has established an apartheid system and thus has engaged in crimes against humanity. Both support the Boycotts, Divestment, and Sanctions (BDS) movement. Our conference of activists learned lessons from each other and we rededicated ourselves to a joint global struggle. This is something we have been calling for as a global intifada against oppression, colonialism, and the neoliberal capitalist world order that makes the rich get richer and the poor get poorer. In visiting the freedom park we saw workers putting names on the wall of those who lost their lives for freedom. Already 4300 names are on that wall (out of lists that could go up to 80,000). One day, we will build a wall like that in Palestine to remember the 60,000 Palestinian martyrs. These are not numbers but real people. Arafat Jaradat died being tortured by the Israeli Apartheid regime last week and he was 30 years old. Steve Biko died while being tortured by the Souh African Apartheid regime in 1977 and he was 31 years old. The two struggles are intertwined. The perceptive words of Steve Biko ring true today in Palestine, in South Africa, and around the world: “The most potent weapon in the hands of the oppressor is the mind of the oppressed.” We the oppressed must free our minds from mental colonization before we liberate our body. We are then really free to work for peace, justice, and freedom. This cannot be achieved without sacrifices/without revolution. The wisdom of the Zulu is striking as is their spirit of defiance. We listened to the music played by young people and as we chatted with elders who all gave us hope for the future. We learned to sing Hayo Matata (no worries) and to say Umuntu ngumuntu ngabantu (a person is a person because of others). The latter reminded me of Vittorio Arrigoni’s constant admonition to us to “stay human”. To be human is to care about others, struggle for freedom and justice in a world of injustice. Come to think of it to be human is then to be revolutionary! “Blessed are the meek, for they will inherit the earth. “ Amen!